There has been a lot of talk about TrimFree on the web and I have decided that I should do a post to clarify any questions that transfer paper users have about this paper. Also, on our next post, we will try to explain some of the problems that a small number of users have been experiencing. TrimFree is a self-weeding laser transfer paper for white or light colored fabrics. What does this mean? Although transfer papers have improved, greatly reducing the visibility of the unimaged areas of the design, it is still necessary to trim the paper to minimize the amount of polymer background that is transferred to the garment. When using TrimFree, trimming is not necessary because it will only transfers the areas on the design where toner is present. TrimFree can be used to image some dark colored shirts such as red, orange and royal blue when the image just contains black toner. 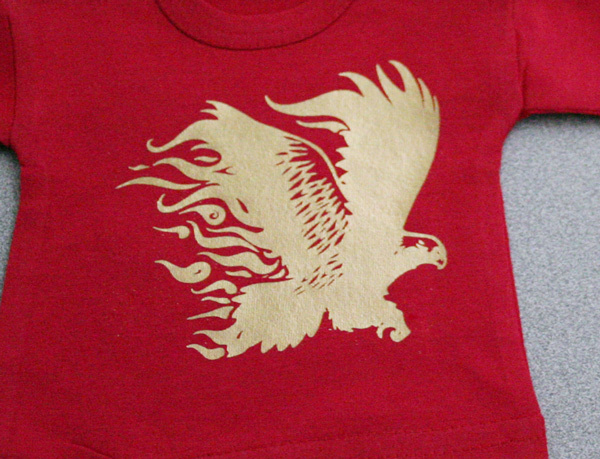 Additionally, TrimFree can be used to image garments using foil. 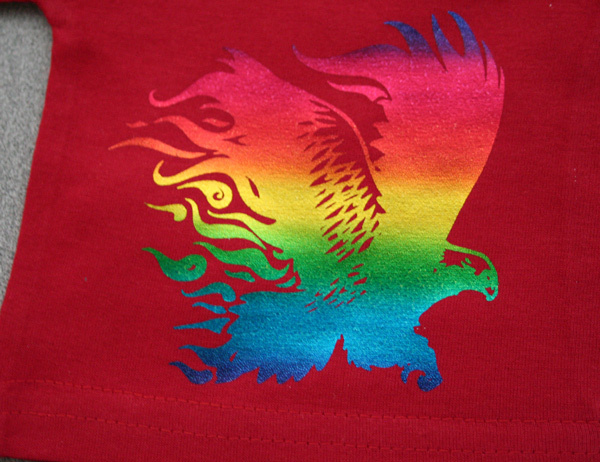 As with red, orange and blue fabrics you only use black toner for this application. 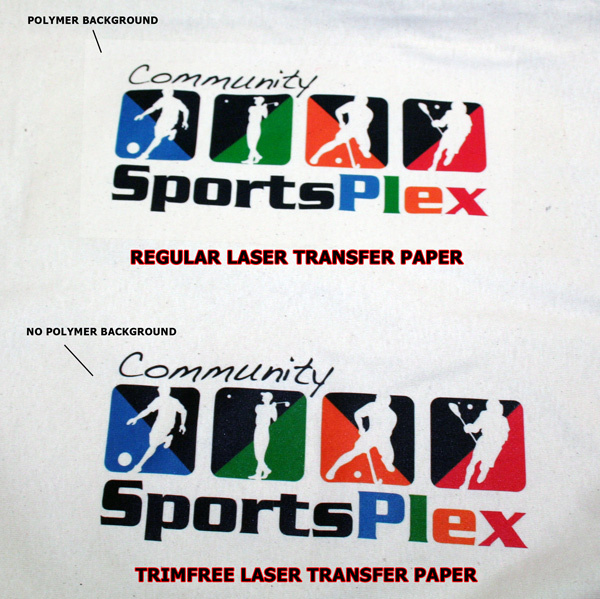 TrimFree is the latest advancement of laser transfer paper; however it has its limitations. On images that have drop shadows, gradients or skin tones the user may find that these areas of the image don’t fully transfer. Knowing this limitation will allow you to properly assess the image prior to printing to determine if TrimFree should be used or if a laser transfer paper for light shirts is more suited. In general, we suggest that TrimFree be used when the image consists of solid colors such as logos or vector graphics. This is not to say that you can never use TrimFree when the image contains drop shadows, skin tones, or gradients but we do suggest you test the image prior to printing your full production. Below you will see one with drop shadows, gradients, and skin tones. The drop shadow was dark enough to show, however the skin tones didn’t transfer as well. 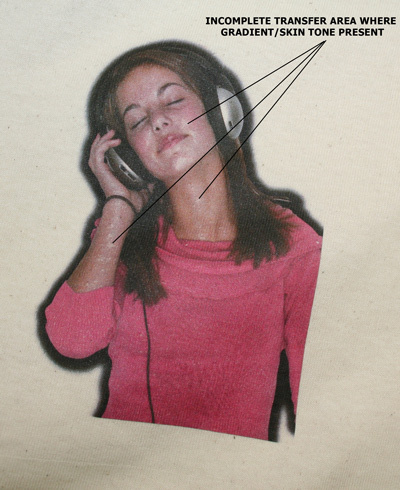 With photographic images we recommend using a laser transfer paper for light colored fabrics. The majority of photographs are square making any trimming quick and easy. TrimFree will work well on most printers but there are some printers that use a type of toner that will either press poorly and/or give you unacceptable wash results. The reason for this is because the self trimming aspect of the paper is a chemical reaction between the toner and the paper coating when heated. 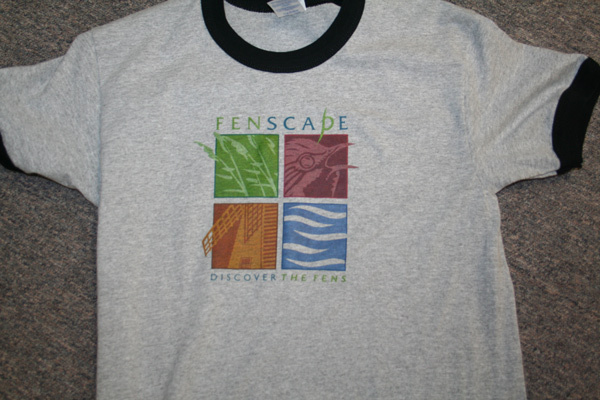 The coating fuses with the toner to adhere to the shirt. So the success of the paper depends on the composition of the toner. With some of the printers we do not recommend, the image will print and transfer fine but the wash results will be poor. On others, it is just very difficult to get good printing results. Our testing has shown that Okidata printers and Canon Copiers provide the best results when using TrimFree. Both of these brands will give very good printing, pressing and wash results. Alternatively, we have found that Brother and HP will not provide good results when using TrimFree and are not recommended by Joto. Regardless of the printer or copier being used we always recommend that you test the paper with your printer to ensure you can achieve the printing, pressing and wash results that will meet your customer’s expectations. To aid with the testing we offer sample packs free of charge for you to evaluate prior to purchasing the paper. 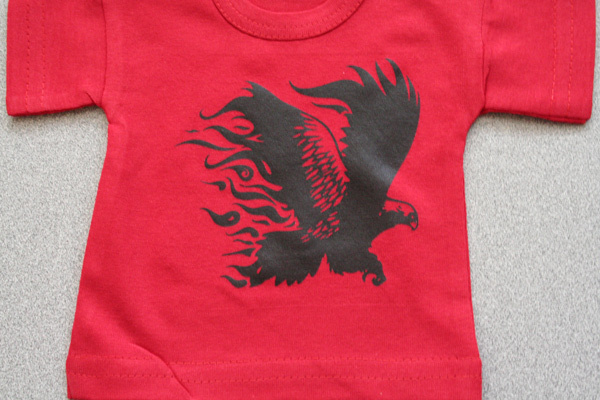 Foil application can only be done with TrimFree transfer paper. 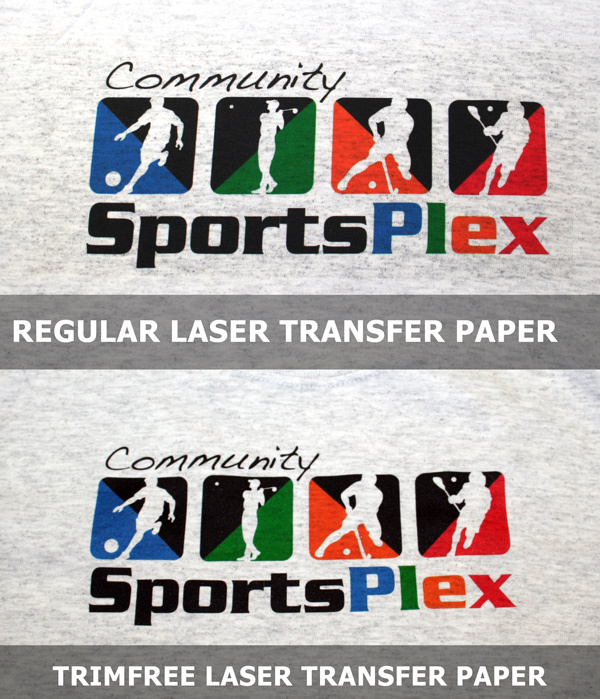 It cannot be done with other laser transfer papers because they release a polymer coating even where there is no image. As stated above, TrimFree only releases where there is toner and it is the toner/coating that hot stamp foil sticks to when pressed. The foil that is used for TrimFree can be bought at any screen printing supplies shop. 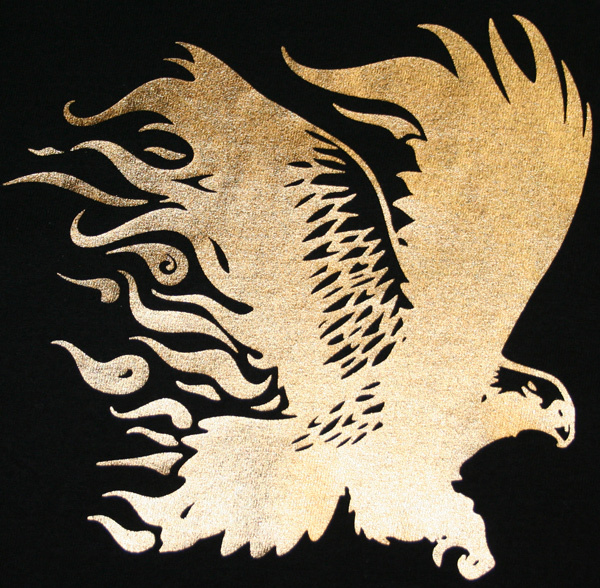 It is the same foil that screen printers use and is applied the same way, using a heat press. Click the following link to watch how TrimFree and foil are applied. We have done a number of TrimFree shirts for personal birthday parties, hockey teams and the response was fantastic! The key to the success of applying TrimFree is knowing the limits of this paper and doing some minor testing on your own so that you can familiarize yourself with this new technology. The ones who are able to master TrimFree will have a definite advantage over his/her competitors.